"How can we push the experience of the female story on screen?" "We definitely needed a female to be at the helm - not just in the directing position, but as many positions as possible," says Larson of the team behind the movie. "[Directors Anna Boden and Ryan Fleck] have come from the same school as me. They’ve come from the indie film world, as I do. We had big aspirations when it came to her strength and the fight sequences, all those things that are very Marvel-y. But then I knew for myself that the emotional beats had to have just as much weight. Making sure that there were people who had that same understanding was important." 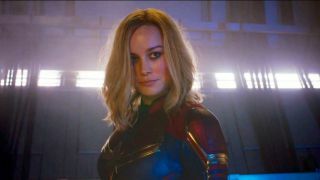 In the interview, Larson also reveals the care and attention to detail that went into portraying the character of Captain Marvel on film for the first time. "Because this character is brand new, we had to figure out the physicality," she explains. "There’s little things like, how do the photon blasts come out of her hands? What is the gesture? When she’s flying, what does that look like? What does that female power look like? So we had a lot of time in that zone. That was really fun, figuring out how the physical self represented that strength." As for the impact, Captain Marvel will have on its audience, Larson didn't want to speculate but did emphasize the importance of putting the female experience at the forefront of movie making. "Those are very difficult questions because I’m not a fortune teller," says Larson. "All I know is that there were a lot of women who came before me that have been asking these questions about what it’s like to be a woman, how can we push the experience of the female story on screen? How complex is it? Where are we at now in history? How can we continue to tell the truth and question things?" You can read more about Captain Marvel, as well as everything else happening in the world of sci-fi and fantasy, in the new issue of SFX magazine, out February 27, 2019.